Two memorial sitting areas adorn our courtyard--a life-sized chair and love seat, made completely of concrete. 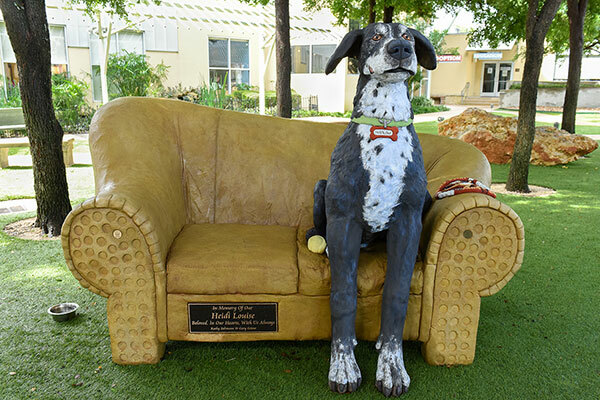 Beloved SAHS alumni adorn both sculptures: Marlow, a sweet Great Dane mix, and Tommy and Turtle, two feral cats that you may see scampering around the grounds! 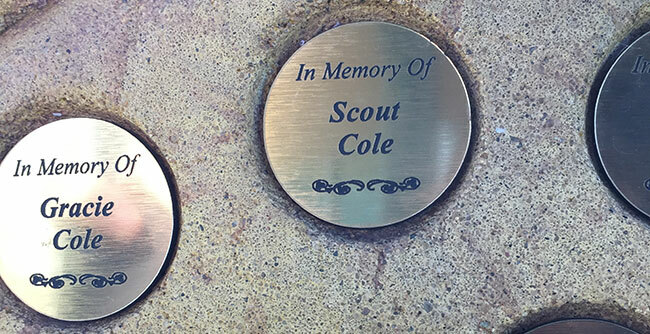 These sculptures contain hundreds of indentations to permanently affix Tribute Tags, 1.5" pet tags that serve as honorariums and memorials. They are a lovely way to pay respect to a loved one, remember a special pet, or to commemorate a special occasion. These gifts to remember or honor someone will help us to provide for the pets in our community.